When I was growing up, our neighbor raised chickens, but he did it in coops, and he sold the chickens, after he took off all the feathers, and took out all the innards, and he also sold the eggs, which were brown, and most often had two yolks in them. They weren't free range. However, a friend of mine, with whom I worked at Answers in Genesis, and who lives in a "holler" in Southern Indiana, wants some free range chickens for her "holler" acreage. Well, I have a solution. She just needs to visit Tortola, BWI. There are chickens everywhere on the Island, and they run free. These pictures are just two examples of how "free" these chickens "range". We were at a beautiful beach in Tortola, and there they were, more FRCs. It seems no one was paying any attention to them, let alone feeding them, but I guess they were getting fed, because they all looked fat to me, ready to be eaten. 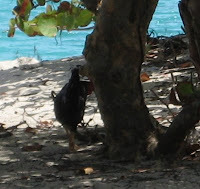 We, those of us who took the "coast to coast" tour, were certain that the "free range chicken" which was available nightly on the cruise, and which, I might add, was "delish" had come from this small Island in the Caribbean. So, Stacia, get on a boat and head over to Tortola, and grab yourself a few chickens. They're free--as free range as you can get. I just wanted you to know I was thinking of you while I was on my most recent jaunt. I can make the arrangements for you. You can fly on a puddle-jumper (not too safe, I don't think). I was at the Tortola airport. I don't think I would want to go there. No security whatsoever. You should convince Seth that you need a second honeymoney in, let's say, St. Thomas or St. John's. You could then swim to Tortola -- it's a long swim, but you could do it, I know because you can see St. John's and St. Thomas from different parts of the Island and they didn't look too far away -- and then tuck those chicks under your suit and swim back. The one problem is that you HAVE TO DECLARE any wildlife you bring back into the States. Maybe you could get some feathers, and plant them, and after millions of years of evolution, you'd have a chicken? I really couldn't help thinking about you, and I had Alan laughing at the picture of you and these particular free-range chickens. Actually, they were so tame they would actually come up to you and peck for food, I suppose. Does that make them no longer free range if they eat "people" food?